Broken rice is fragments of rice grains, broken in the field, during drying, during transport, or by milling. Mechanical separators are used to separate the broken grains from the whole grains and sort them by size. Broken rice is fragmented, not defective; there is nothing wrong with it. It is as nutritious as the equivalent unbroken rice (i.e. if all the germ and bran remains, it is as nutritious as brown rice; if none remains, it is only as nutritious as white rice). Broken rice has a long history; Ibn Baṭṭūṭa mentions rice couscous in the area of Mali in 1350, presumably made of African rice. Broken rice from a rice huller will be brown whole grain; broken rice from a gristmill may be white. Cơm tấm (literally "broken rice") with a lemongrass pork chop, from Vietnam. A thieboudienne from Mauritania, with tomato broken rice, fish, and vegetables. Due to the different size and shape of the grains, broken rice has a different, softer texture from "unbroken" rice, and absorbs flavours more easily. It cooks faster, using less fuel, and can be used to make rice porridges and congees, which need long cooking times. The broken varieties are often less expensive, and so are preferred by poorer consumers, but they are also eaten by choice, with some cookbooks describing how to break unbroken rice to produce the desired texture or speed cooking. Broken rice is consumed as part of local cuisine in West Africa (where the traditional African rice is easier to break), Thailand and elsewhere in South East Asia. In Vietnam Cơm tấm (literally "broken rice") is a popular rice dish with pork. Thieboudienne is a popular dish in west Africa often made with broken rice. Broken rice is called rice grits or middlins in South Carolina. 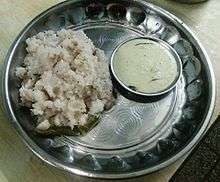 Very small broken rice is called brewers' rice, as brewers traditionally use it, although it is also sold to other users. Broken rice is also used to make starch which is used as laundry starch and in foods, cosmetics and textile manufacture. ↑ G. J. H. Grubben, Sutjipto Partohardjono, Cereals Prosea Project - 1996 - Page 114 "On milling, paddy gives approximately: husk 20%, whole rice 50%, broken rice 16%, bran and meal 14%. 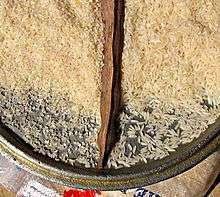 The husked or hulled rice is usually called brown rice, and this is then milled to remove the outer layers, including the aleurone layer "
↑ A. Th. G. Elzebroek, Koop Wind Guide to Cultivated Plants 2008 - Page 346 "In West Africa, a hybrid between O. sativa and O. glabberima has been developed. This new hybrid, labelled 'Nerica' ... grains are sold as 'broken rice'. 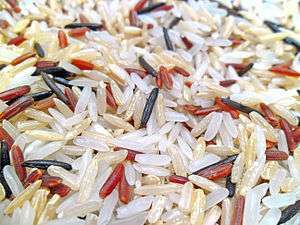 Very small broken rice is called 'brewers' rice', generally used for industrial purposes. On milling paddy gives approximately 20% husk, 50% brown rice, 16% broken rice, 14% bran and meal. ↑ "Broken rice kernels and the kinetics of rice hydration and texture during cooking.". J Sci Food Agric. 93 (7): 1673–9. May 2013. doi:10.1002/jsfa.5948. PMID 23174947. ↑ Grain market report International Wheat Council, International Grains Council -- Nos 276/285 1999 -- Page 36 "Thai 100% grade B white rice (referred to as "white rice" in this section) is a widely-traded, high- quality variety, and Thai A1 Special broken rice represents a cheaper type that is often marketed to West Africa, for example. Many other types and ..."
↑ William E. Burns Science And Technology in Colonial America 2005 - Page 12 "... purpose in West Africa. The baskets were then rotated and tossed to separate the lighter hulls from the heavier grains. The long-grain rice, the famous "Carolina Gold," had to be handled carefully to avoid breakage, as broken rice was of less ..."
↑ Rice Grain Quality and Marketing 1985 Page 6 "However, the export demand for broken rice prices in Thailand is almost as high as for medium-quality whole rice, due to rapidly increasing demand for broken rice in West Africa, mentioned earlier. Thailand broken rice is long-grain, clean and ..."
↑ Texas Monthly April 1975 - Page 110 Uncle Ben "Of the 70 pounds of milled white rice, only about 55 pounds can be counted upon to ...... The other fifteen pounds of broken rice are shunted aside by a "sifting" machine and sold to the export market or to brewers. In the final step before packaging, Uncle ..."
↑ Martin Brink, G. Belay Cereals and Pulses 2006 - Page 113 "Oryza sativa – planted about 800–900 AD, to West Africa. The final penetration of Oryza sativa into ... Starch made from broken rice is used as laundry starch and in foods, cosmetics and textile manufacture. Beers, wines and spirits are made ..."